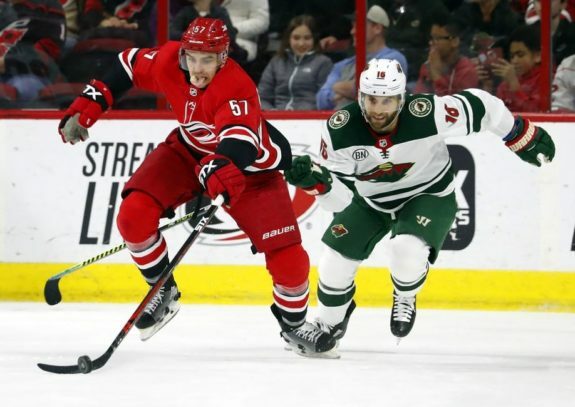 RALEIGH, N.C. — Teuvo Teravainen had a goal and two assists and the Carolina Hurricanes kept pace in the playoff race with a 5-1 win over the Minnesota Wild on Saturday night. Eric Staal scored and Devyn Dubnyk made 28 saves for the Wild, who dropped out of the eighth and final playoff spot in the Western Conference with the loss and Colorado’s 4-2 win over Chicago. Minnesota played without leading scorer Zach Parise after he took a high stick to the face against Washington on Friday. Just over two minutes later, following a Wild turnover at centre ice, Justin Williams fed Pesce at the top of the left faceoff circle and Pesce finished with a wrister past Dubnyk’s glove into the upper-left corner to make it 2-0. Teravainen added the final punch when he stole the puck at centre ice and beat Dubnyk on a breakaway. NOTES: Teravainen recorded his 50th assist of the season on Jordan Staal’s goal, and Sebastian Aho recorded his 50th assist on Pesce’s goal. They became the first Hurricanes teammates with 50 assists in the same season since Rod Brind’Amour and Ray Whitney in 2006-07. … Wild F Joel Eriksson Ek (lower-body injury) missed his sixth straight game. He is day to day. … Carolina improved to 10-3-1 in its last 14 games. … The Wild have won just three of their past 11 games.